John Mellor Estate Agents are the team you want to talk to when you are selling your house and/or buying a new one. 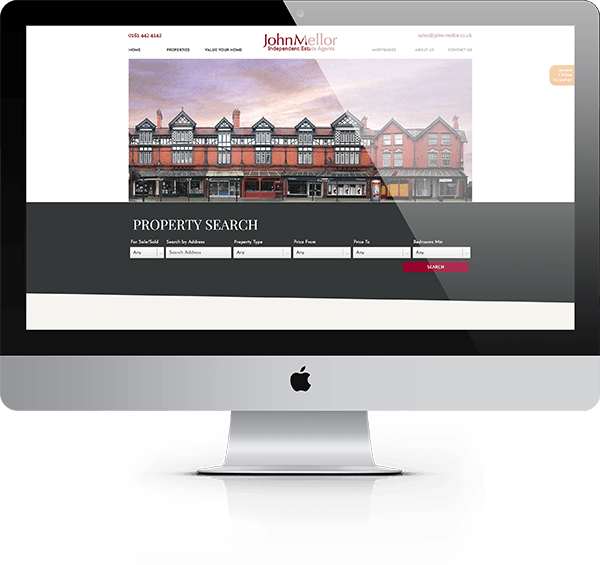 As the leading estate agent in Heaton Moor, our brief was to modernise the website without losing the brand identity the company had worked so hard to establish over their 35 years in business. Nowadays, when people are looking to buy a new house, they are likely to start their search on Rightmove or Zoopla. But when people are looking for an estate agency to sell their home, they are looking on specific agency websites, so it is key to demonstrate how trustworthy, honest and hardworking that agency is and show the care and attention with which they advertise the properties for sale. Our main instruction from the client was to create a website that would increase the number of enquiries from people wanting to sell their home, so we designed and developed a website that has fulfilled and surpassed their expectations. The old website was unattractive, old fashioned and did not adequately show off the beautiful properties that John Mellor had available for sale. The conversion rate of the website was poor, and the user journey was confused. Buying a home is an emotional process, so when users are viewing the properties on the website they need to be inspired and excited by what they see. Similarly, when you are selling your home, you want to know that your estate agent is showing it in all of its glory. The property photos are key but they have to be displayed in a beautiful environment, with all of the necessary information being easy to find and easy to read. It was therefore our task to build a website that was much more attractive, much more engaging and much easier to use in order to properly capture the attention of the user. We completely updated the website design, creating a contemporary, beautiful, image led site that captures the attention of the user. 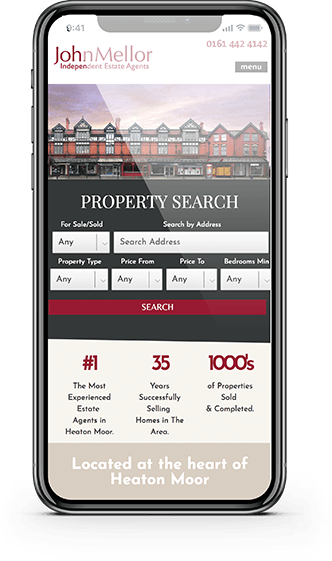 The property search function is front and centre of every page, with a quirky, asymmetrical design that draws the eye, consistently calling the user to explore the properties that John Mellor have to offer. Key statistics and Unique Selling Points (USP’s) are central to the design of the website, constantly demonstrating expertise and building trust. We incorporated an instant online valuation as another Call To Action (CTA) button on the site, drawing website users to enter their address and get an estimate of the value of their home. John Mellor are then able to market themselves to those who have used this feature via email, telephone and in the post. We integrated a mortgage calculator feature to make sure that the website users aren’t leaving the John Mellor site to work out this crucial information. Behind the scenes, the website ties in with the companies property management system Jupix. 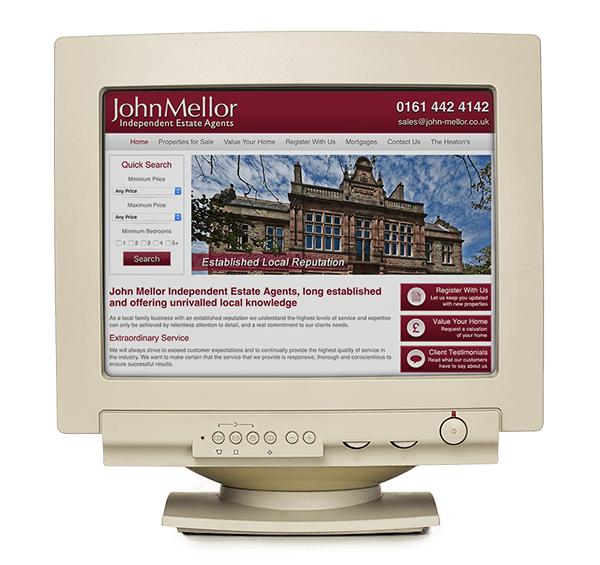 Rather than manually updating multiple property websites with new properties, a property only has to be uploaded into the Jupix system once for it to then be uploaded onto Rightmove, Zoopla, and, thanks to a bespoke XML feed, the John Mellor website. Our development team worked tirelessly to integrate this Jupix system seamlessly into the WordPress CMS system, meaning that updates that are made on Jupix are automatically and instantly pulled through onto the John Mellor website. This integration has halved the work required for the sales team, as previously properties had to be uploaded to each website individually.